Is it fair enough to say that startup websites go for shared web hosting plans? To a certain extent, it is a good choice that it comes with a low budget and meets your business requirements easily. Isn't it? For the time being, everything would work smoothly as expected, but gradually, you might start facing some issues. Want to know how? Continue reading this article and know more about it. As your business expands and you'll receive more customer engagement, your sharing web hosting plan might seem tiresome to meet your website requirements. At this point, you might realize that something is wrong with your hosting plan and it's time to upgrade to a better version. No worries, there is a bundle of hosting plans which will perfectly match with your requirements to keep your website always available on the customer's end. The primary thing to be considered while upgrading your hosting plan is to avoid opting for the cheapest vendor for the task. It is essential and beneficial to find a suitable platform that offers and meet your website update requirements. Following are some of the signs that point towards update and upgrade of your hosting plan. Your site performance is falling: Performance and speed have been the key drivers for the success of a website. They are responsible for playing an important role in search result rankings and user experience as well. Remember, a slow and time-consuming website attracts no customers, it becomes essential that you get separate resources for your website, instead of continuing with the shared one. Your site experiences downtimes: If your website is experiencing downtimes quiet often when the traffic is more, it means that you are using the wrong hosting plan. And if the user is unable to view your website on the first attempt, there are 99% chances that he will not visit your website ever again. You need to have good uptime and go for a hosting plan with no downtimes. Your website needs more security factors: As long as you are dealing with a small audience, you can go for a shared hosting plan. But when you start dealing with your customers' confidential data, you look up for more security features on your website. Upgrading to a better hosting plan lets you stay safe from the data attacks and keeps the user data secure. Your hosting plan doesn't offer much space: As you add more pages and features to your website, your website will obviously demand more space in order to run smoothly. You must upgrade to a plan which is offering a good space for your website and is able to tackle all the website requirements. 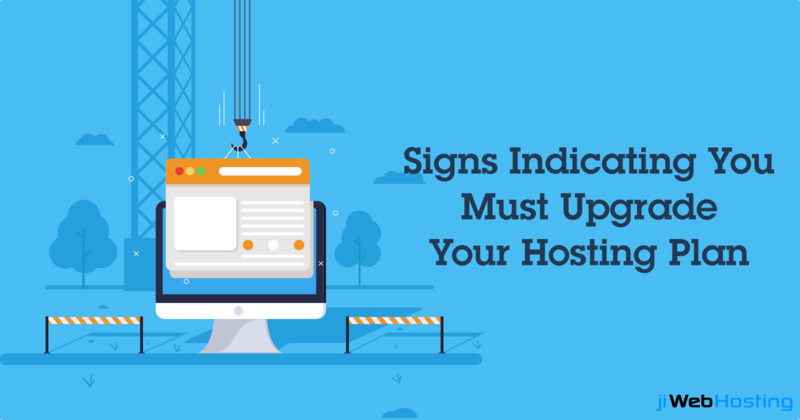 Even if you are struggling with one of the above signs, it's time to rethink and reanalyze your hosting plan. And if you are looking for a trustworthy and reliable web hosting vendor, you can rely on jiWebHosting which has the perfect hosting plans for your business at the most affordable prices. Have any queries? Get in touch with us at any time and get assistance!